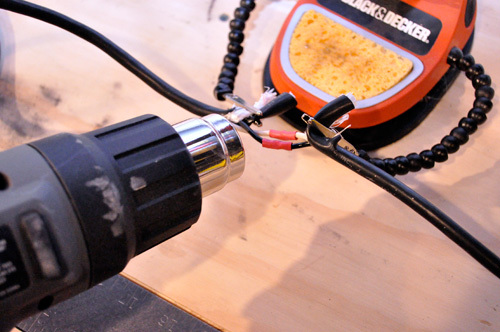 Contractors can be brutally tough on their tools, and given enough time, it’s not uncommon for a power tool cord to get nicked, damaged or even completely severed. Some manufacturers have responded with removable power cords that are easy to replace, and those have been met with mixed reviews. 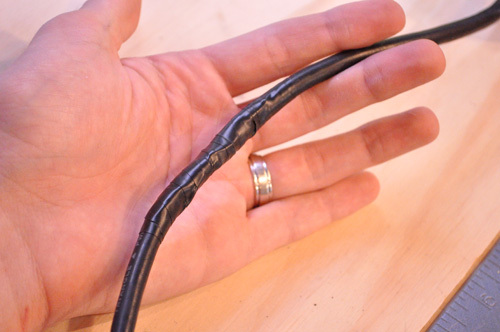 However, fixing a broken cord isn’t difficult, and it’s cheaper than buying a new one. 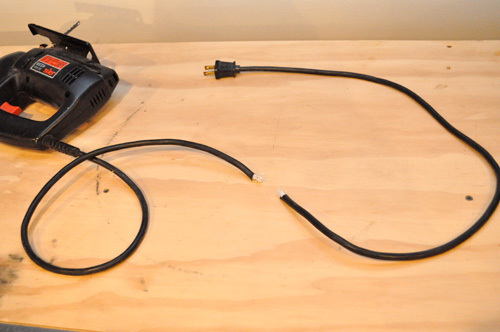 Today’s article is going to show you how to repair a broken power cord, and I sacrificed an old SKIL jigsaw for this demonstration. After I’m finished it’ll look just as good as before, albeit a little shorter. 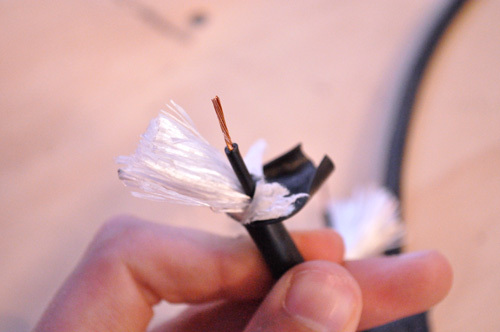 You can see my miter saw made short work of this power cord leaving jagged and frayed edges. I trimmed both ends with cutting pliers. Next, I used a utility knife to slice the outer sheathing much like cutting Romex. I made a lengthwise cut about 2″ long, and peeled back the sheathing. I separated out the black and white wires, and used wire strippers to remove a short length of insulation. 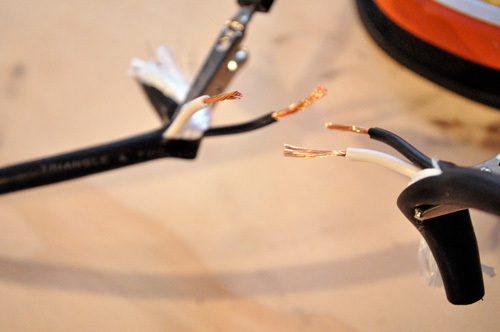 Odds are that your power cord is composed of stranded copper (like mine) so be careful not to cut any of the strands. At this point I set both ends into the alligator clips on my soldering iron station. Before connecting the wires, I slipped a heat shrink tube in place. 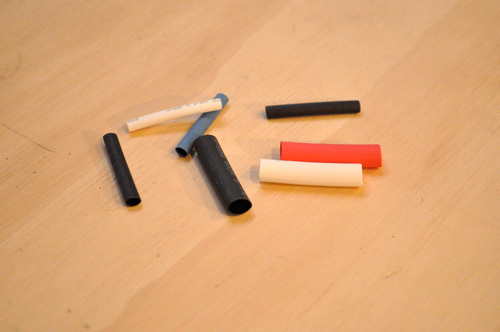 Heat shrink tubes will only constrict so far so select a tube that is just big enough to fit over the finished joint. I paired the black wires and white wires, and wrapped them in-line with the rest of the cord. 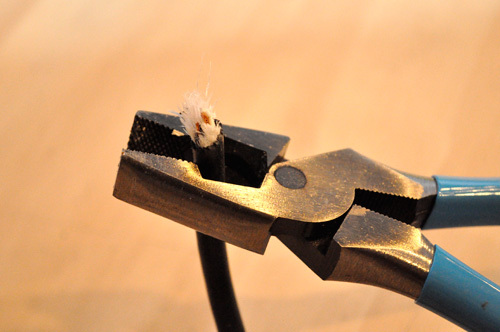 I used the soldering iron to heat the splice, and when it was hot enough, applied the solder. 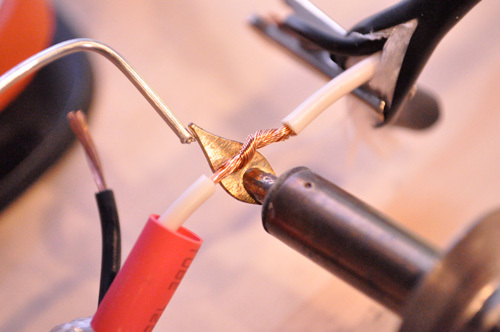 A good soldering iron (not like the one I used) will be able to heat the splice quickly and melt the solder without too much trouble. The solder I used melts at 430° F so make sure your soldering iron can get hot enough. 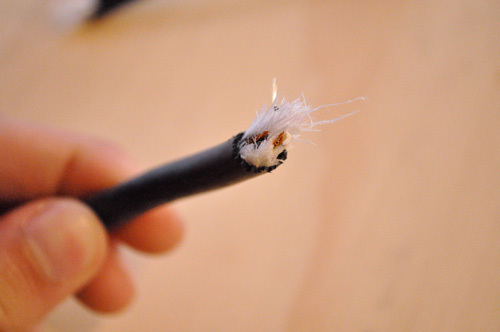 I tried to make a nice, smooth connection with plenty of solder holding the wires together. Next, I repeated this process for the second pair of wires. Soldering irons get really hot so be careful not to burn yourself or the wire insulation. If you make a mistake, trim the ends and start over. When the soldering was finished and the splices had cooled, I slid the heat shrink tubes in place, and applied low heat with a heat gun until the tubes were tight. Lastly, I cut back any overlapping sheathing and removed some of the filler string. Then I wrapped everything with a couple of layers of electrical tape. In the end, my SKIL jigsaw worked just like before. The cord is completely repaired, and you almost can tell it was ever damaged. Why the need to solder at all? Is it just for increasing strength of the bond? I would think that a good splice with the shrink tube would suffice. I don’t think a simple splice would hold up well over time. I think it’d be too easy for the stranded wire to come apart. Probably so you can continue to pull the plug out of the outlet by the jigsaw! You don’t want those pesky twisted wires to come apart when unplugging from 6 feet away! Not a smart way to unplug ANYTHING. Ethan are you an electronics guy? I typically just use my iron to shrink up the heat shrink. I use different tips though. I’m betting that if a safety inspector saw that fix on a job site he/she may ask what the tape is all about but if you explained that you soldered and sealed up the wires, no problem. That tip wasn’t ideal. I was hoping to find something that would provide some surface area to heat up the copper faster. It was still really slow, and that’s why I mention that a better iron is worthwhile. That repair certainly will work around the house and it’s certainly acceptable in my mind. However, it won’t fly on a jobsite. OSHA will fine you in a heart beat. There are only two options for chord repairs with OSHA. – New chord end with original chord. The end must be UL rated. 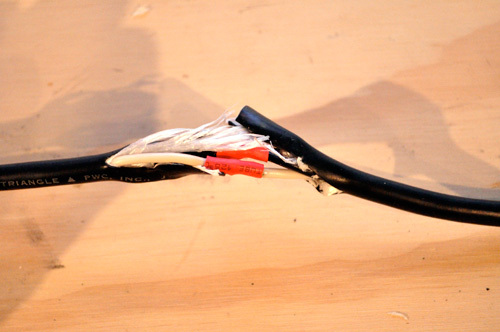 Taped/spliced/soldered connections will result in a fine. Thanks for the clarification. I’m just starting hour 1 of OSHA 30. I’m sure cords will be covered when talking about electrocution hazards. Chords are one of the top fines next to PPG. the good thing is, a new chord or connector are not very expensive to replace. Beat me to the punch Todd. I’m glad I checked the comments before posting! 1. 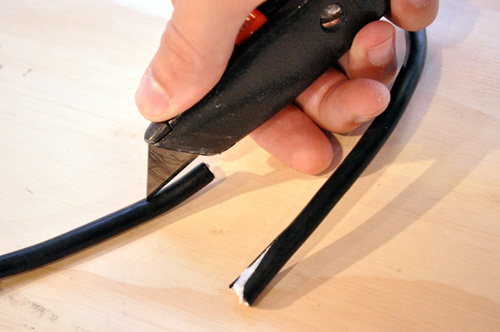 Use larger heat shrink tubing over the whole work instead of electrical tape. The tape will peel off in time. 2. If you don’t have a heat gun OR a hair dryer, holding and rotating it over your range element on high will do the trick. I debated buying bigger heat shrink tubing since you can get just about any diameter. The tape is still a good option, but you’re probably right about the longevity. I was expecting a new end to be put on the cord like Todd suggested. 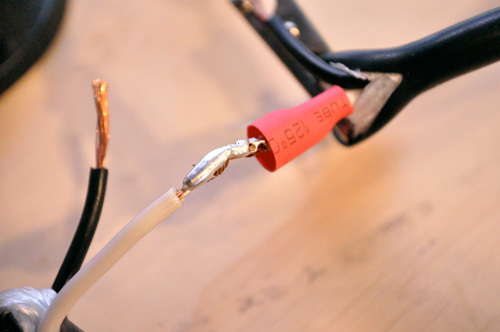 Heat shrink is great for other repairs, like glasses. I have a set that broke at the hinges (which are a little ways back on the arm), and I just use heat shrink to hold them together, they don’t fold anymore… but who cares. When the heat shrink is busted enough for them to fall off constantly, I replace it. 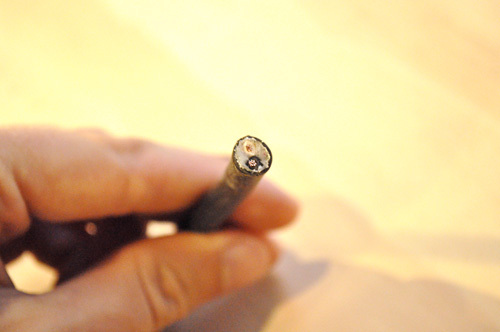 Dad always used his cigarette lighter to shrink the tubing. I didn’t know you could still buy heat-shrink tubing. I thought that was one of my dad’s old-timer tricks that fell out of popularity. I’m happy to see no duct tape was used. lol some think its a fix all. 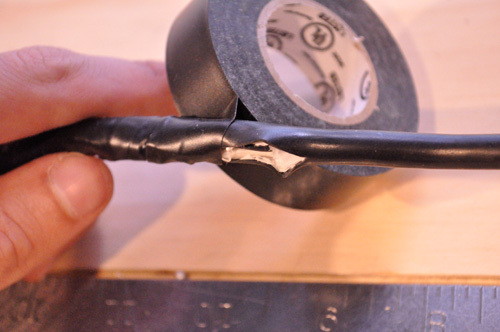 I agree with using a larger shrink tubing instead of the tape. I’m not sure if this has been mentioned yet… but you could use heat shrink tubing around the whole thing. In all seriousness, it looks good. May not be completely up to code, but it gets the job done! At first I wondered why bother and not just buy new piece of equipment. Then I thought about the costs of replacing expensive equipment in lieu of this solution. I don’t have the needed equipment or skill, but it’s good to know. thanks. Haven’t seen soldering flux mentioned and the soldered connection in Step 4 looks really “dry” as in solder didn’t flow and didn’t soak the copper strands. 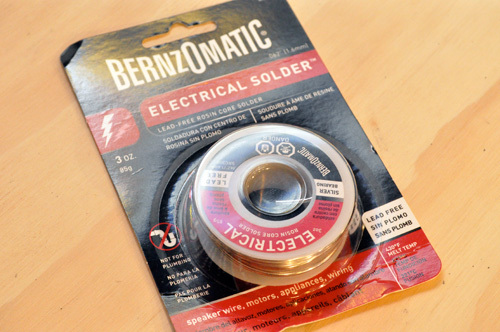 That’s exactly what a dip of the stripped end of the wire into a can of some soldering flux paste would do – it will make the solder flow easily once melted, soak into the strands and cover everything very nicely. Produces a lot of fumes, obviosuly, but very much worth the (little) inconvenience. I would definitely advise using flux when soldering. Welcome to OPC, and I hope to see you comment again! I loaded up that joint pretty good with solder, and the solder has a flux core. You’re right that it could have been a bit better. You have to be careful adding flux because if it’s not clean up afterward, it’ll eat through the copper eventually. I need to buy a soldering iron. Any recommendations for a first timer? Depends on what you are going to do with it. My first was a red-handled Webber 40-watt that I got on Amazon for pretty cheap but a Webber blue would have been better. Something with a finer tip. I use mine for light electronics and automotive work. I’ll check them out. I’ll be doing similar work. No real circuit work or anything, unless I decide to make some crossovers for diy speakers. Ethan- Thanks for the informative demo. It frustrates me when I see people using obviously unsafe cords. I think your fix would work fine for DIY folks, even if it wouldn’t pass OSHA standards. I split some speaker wire and can NOT remember which is the positive wire…the wire with a rib on it or the wire w/o a rib? Thank you.